Waging war against the menaces that have surrounded one of my jalapeno plants. The handy tool I'm using it call a hand hoe and has quickly become my favorite tool for the ground war against weeds. 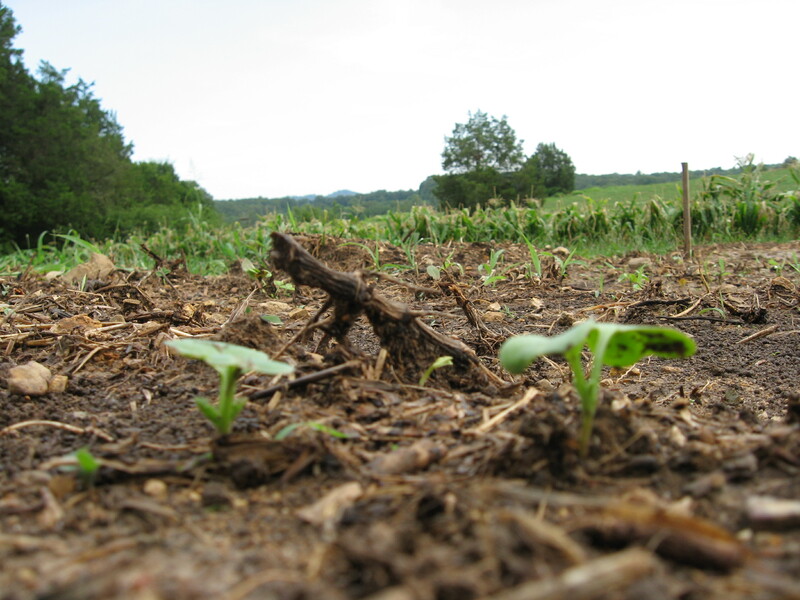 After I cultivated the land and waited for what remained of the grass to die, the process of seeding began. The garden has been growing for nearly a month now so it’s probably a good time to describe the ways I started planting my future food. There are two ways of trying to get food from a tiny seed that I use, direct sewing and transplanting. It’s true that you can get food without ever having to get dirty via hydroponics but it’s not very cost effective and takes a lot of skill and know-how that I just don’t have. A radish's eye view of the garden. I have never had luck transplanting any root vegetables. These are direct sown. Direct sewing is by no means a technical term, it means putting the seed in the ground. How deep you should plant the future food depends on what your putting under. Depths usually range between 1/8 of an inch to an inch-and-a-half. Transplanting takes a little more work but reaps greater benefits in the end. Instead of throwing your seeds into the ground, watering and hoping for the best, when you transplant you grow a small plant in controlled conditions before releasing them into the wild and murderous world that young plants struggle to survive in. A plant that hasn’t yet been put into the garden is called a start-up. To create a start-up you can either use the blister packs that they sell at places like home depot or dixie cups with holes cut into the bottom, to allow for drainage. I’ve gone with both store bought and the cup method in my garden at home. After you have the container you need to fill it with potting soil, regular soil compacts and won’t let water drain properly. After putting a few seeds in each container all the seeds need is regular watering and some time. Soon you’ll start having your own transplants ready without spending the $3 dollars they would cost at Lowe’s. In order to keep the cost down, try buying seeds late in the season. A lot of seed packets get discounted once summer starts and if you wait a little longer you can buy cheap start-ups too. We bought a flat of jalapenos and bell peppers for a dollar because the owner of the local feed store was tired of taking care of them. Another way to avoid seed costs is to split the price of seeds with someone else. I almost never use all of the seeds in a packet, my operation is too small to plant everything. This year a friend, Aaron and me started trading seeds with each other. I ended up with a lot of new plants without spending any extra money. Sometimes when someone has an abundance and I have nothing, I’ve just asked for seeds they won’t use and I’ve gotten them. Why waste them when someone else could use them? My personal feeling is that if you take, though, you should also give, as a result I like to share the harvest with whoever helped contribute. For a garden map I planted stakes into the ground and then made a small map showing what is planted at which stake. Simple but effective. Either way you choose to plant, a few things are good to remember, I learned them both by forgetting. When I planted my first garden I forgot to leave space to walk between the rows. As a result I ended up killing more than a couple of plants by stomping around like a drunk ballerina, ironically I was trying to avoid stepping on anything. My kale and tomato plants would testify to this if they were still here. 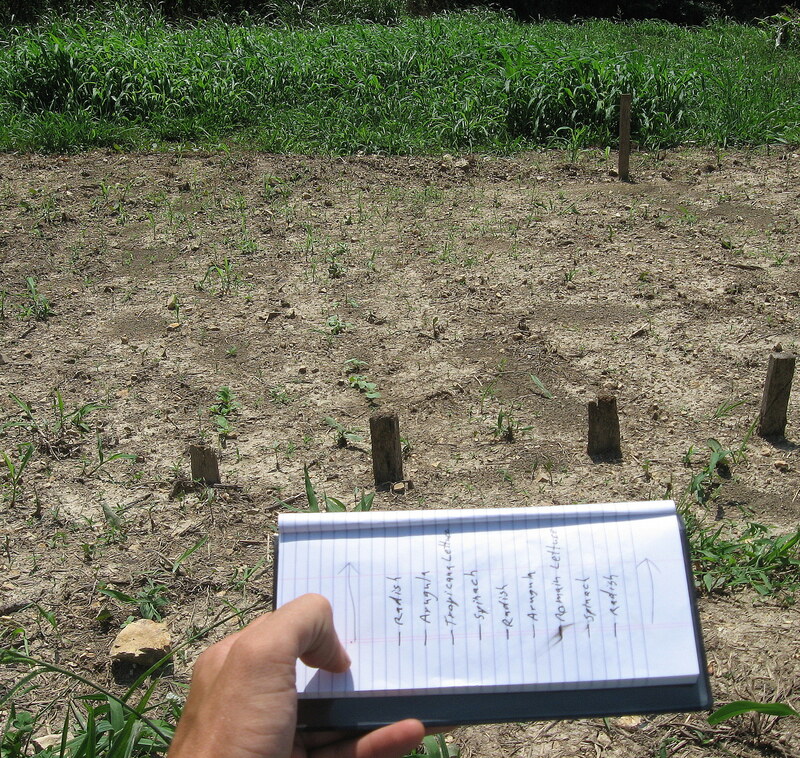 Another thing I like to do is keep records of what I have planted and where. Record keeping will help avoid plucking up your good plants when you’re trying to weed out the bad. I’ve found that keeping track of when I planted and when I harvested is also extremely helpful. The expected harvest dates on the back of seed packages are only estimates and depending on your soil and location only experience seems to be able to tell how soon something is going to be be popping up. 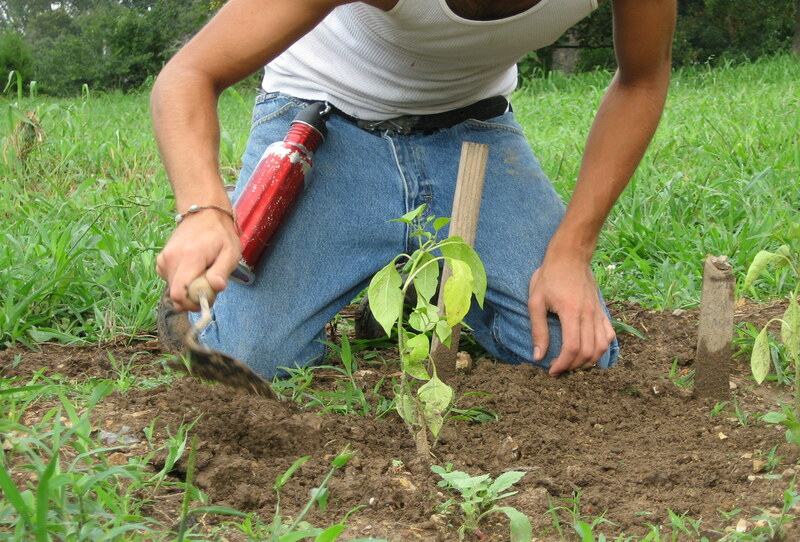 Coming up: Weeding and the best tools for waging the ground war.